Doctor’s Choice™ for Diabetics / 90 tabs - Nature's Way®. Individuals with diabetes have specific nutritional needs. Why use Doctor's Choice™ for Diabetics? It provides optimized nutrients for individuals with diabetes. 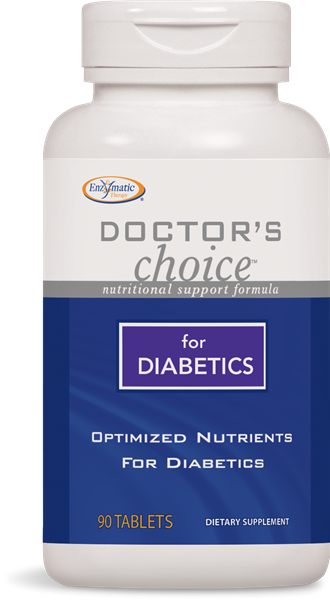 Doctor's Choice™ for Diabetics provides targeted nutritional support for individuals with diabetes. It is intended to be taken as a booster to a healthy diet and/or with a multivitamin-mineral supplement. This unique formula combines optimal levels of essential nutrients, antioxidants, minerals, and vitamins to help the body function at its peak. Take 2 tablets twice daily. Can be taken with meals. Caution: Not for use during pregnancy. If you are nursing, have diabetes, or are taking any medications, consult a healthcare professional before use. ‡Complexed as citrate, fumarate, malate, succinate, and alpha ketoglutarate. Is Doctor's Choice for Diabetics a stand-alone supplement, or can I take it with my regular multivitamin? Doctor's Choice for Diabetics is designed to be used in conjunction with one of the age- and gender-appropriate Doctor's Choice™ multivitamins.